Place all the filling ingredients in a medium bowl and stir well with a metal spoon until just combined. Cover and chill for 10 minutes. While the prawn and pork mixture is chilling prepare the dipping sauce by mixing all the sauce ingredients in a bowl. Set aside at room temperature (for up to 3 hours) until ready to serve. Stir again briefly before serving.Line a large baking sheet or rectangular dish with paper towels and dust lightly with flour. Place a wrapper on your palm, then put 1 heaped teaspoon of the filling in the centre of the round. Moisten the edges with a wet finger and fold it over in half to form a half-moon shape. Using your thumb and forefinger press to form 10 to 12 tiny pleats along the edge to seal. Shape the dumplings so that the base of the dumplings are flat. Place finished dumpling on the floured surface and repeat with the remaining wrappers and filling. Heat 1 tbsp vegetable oil in a large nonstick skillet over medium heat until hot but not smoking, then carefully place the dumplings on the pan, seam sides up. 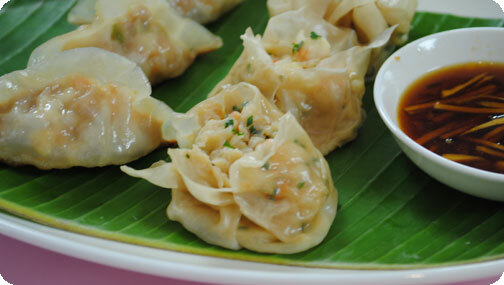 Fry dumplings for 2-3 minutes, until bottoms are pale golden then add 50ml water and quickly cover with a lid. Leave the dumplings to steam until all the liquid has evaporated (about 5-6 minutes), if the pan is dries up quickly and the seamed edge still appears white and uncooked add a little more water and replace the lid. Remove the lid and add the remaining oil, swirling the pan a little so that the oil reaches the bottoms of all the pot stickers. Let them continue cooking (uncovered) for a couple more minutes, then lift with a spatula to check that bottoms – once they are crisp and golden they are ready. Serve dumplings immediately (but be careful when you bite in – they will be hot! ), with the dipping sauce. Lay a gyoza wrapper in front of you. Wet the edges. Put 2 to 3 teaspoons of filling in the middle, taking care not to get too close to the edges. ather up the edges of the wrapper and gently pleat so that it forms a basket shape, with the top of the filling exposed. Steam over boiling water until the filling is cooked through (5 to 10 minutes)..
Bring a wok full of salted water with a lid to the boil. Place the pack choi on a plate that fits into the bamboo steamer. Cover with the sauces, garlic and chilli. Cover with the bamboo lid and place into the wok, making sure the bottom is not immersed in the water. Cover with a lid and steam for 5 minutes or until tender. Serve immediately.